A need for shade outside the glass walls of this contemporary home was the catalyst for an interesting cantilevered terrace pergola. 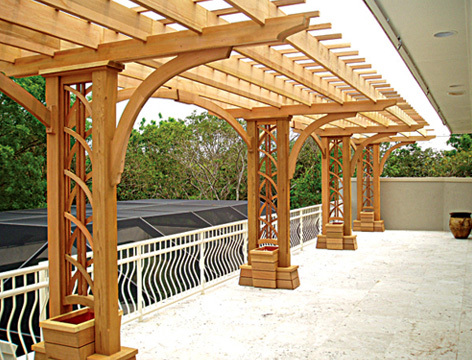 Using the trellis sides of our Chesapeake Arbor as a design theme, a truly unique pergola was the result. The planter boxes are copper lined and can be slid in or out and are integrated with the attachment plates. The planters will allow for vines to establish shade in the year-round Florida growing season.